As a junior at Yale in 1988, Robert Ferry was unsure where the future would lead him. To a career in medicine, research, academia, or something else entirely? Facing the same uncertainties of many college students today, Ferry sought to serve something greater than himself — a mission he continues to pursue today. Since attaining his degree in molecular biophysics and biochemistry from Yale College in 1989, Ferry’s core philosophy has led him on an unconventional path to become a modern medical leader. Ferry said that as a college student, he would never have predicted the twisting, turning directions his career would take. Still, a common thread runs throughout the great variety of his experiences in medicine and research — they are all underscored by a commitment to service. From childhood, when he first became curious about science and medicine, Ferry’s journey through college, medical school, fellowship, and military service tells a unique story about what it means to be a passionate doctor. Since 2010, Dr. Ferry has been a tenured professor of pediatric endocrinology at the University of Tennessee Health Science Center in Memphis. In addition, he has served as the State Surgeon for the Texas Army National Guard since 2013. Colonel Ferry supervises medical readiness for more than 19,000 troops assigned to the nation’s largest state army. Ferry traces his passion for science and, indirectly, for medicine back to his youthful years. Ferry’s father was an amateur botanist who earned his own PhD in botany at age 69 after retiring as a high school science teacher. At age nine, on a plant collection expedition with his father, Ferry discovered Calycanthus brockiana. This became the subject of his first peer reviewed paper, published during his junior year at Yale. As he trained to become a doctor, Ferry developed his philosophy of service, which continues to define his career. “Medicine is at the intersection of scientific discovery and helping people,” Ferry said. Among his role models as an undergraduate was the late Dr. Howard Spiro, professor of gastroenterology at the Yale School of Medicine. Spiro taught Ferry to listen to people and to communicate better, skills which fostered a more empathic physician. During medical school, Ferry chose to become a pediatrician because of the simple joys he felt taking care of children. “There’s nothing larger than the future of a child,” he said. Among his diverse clinical work, Ferry has been conducting research on type 1, or juvenile diabetes, which most commonly begins to affect patients before age 20. Ferry has co-authored more than 75 peer reviewed papers and more than 40 book chapters on the development and treatment of endocrine disorders. His diverse contributions to medicine range from researching the basic molecular mechanisms of insulin-like growth factor in key cell types, to investigating the impact of Medicaid on the quality of hospital treatment for diabetic youth. After Ferry graduated from Yale at age 19, major geopolitical changes around the world suggested a lasting peace following the Cold War. As the Berlin Wall fell and the Soviet Union dissolved, Ferry completed a clinical physician’s typical training: medical school and residency in his native Texas, then a fellowship in Pennsylvania. After the disaster of 9/11, however, Ferry heard the call to volunteer in the service of country. His father, himself a Vietnam veteran, cautioned his son about the dangers of war. But Ferry recognized that few people step up to serve our country’s Armed Forces, and even fewer physicians volunteer for military service. He felt deeply obligated to serve when others could not or would not. Against his father’s wishes, Ferry joined the Army and voluntarily deployed to Iraq as a wartime field surgeon between 2005 and 2006 and again in 2009. 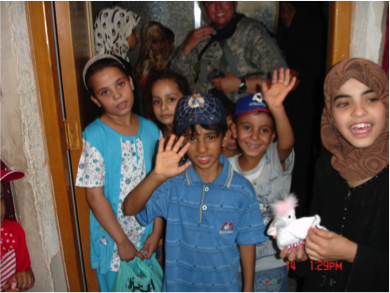 While on duty in Iraq, Ferry delivered supplies to the Al Amal Institute for Deaf Children, among serving other roles as a military physician. Image courtesy of Robert Ferry, Jr. The medical challenges and wartime horrors that Ferry encountered will forever strengthen him. In October 2005, Ferry’s fellow medic in Iraq, specialist Russell H. Nahvi, was killed in action by a roadside bomb. This loss in particular serves as a constant reminder to Ferry that we cannot take freedom for granted. The countless sacrifices he has witnessed sustain his humane values and unique perspective on human nature. He certainly speaks with conviction, seeded perhaps by Yale’s uncommon opportunities, but tempered by common realities elsewhere. Today, Ferry does what he loves, serving others in both medical and military roles. He has done community service in local medical reserve corps in Texas and Tennessee. In the time between his two army deployments, he also deployed thrice with the International Medical Corps to provide continuing medical education in Iraq. Remarkably, in 2004, he served as the physician on a multi-jurisdictional team during Super Bowl XXXVIII in Houston. For current undergraduates, Ferry offers a few pieces of advice. He urges students to take advantage of the intellectual depth fostered at Yale by exploring as many ideas as possible. “It’s like you’ve been invited to a grand feast, but there’s not enough time,” Ferry said. “Encounter all the ideas you can at Yale, and sink your mind into them.” He speaks from personal experience. As an undergraduate, Ferry somehow found time to be a photographer, coxswain for Silliman’s intramural coed crew, serve as Managing Editor of the Yale Scientific Magazine, and become a published researcher. Cover Image: Ferry (third from right) served as a wartime field surgeon in Iraq in 2005, 2006, and 2009. This experience continues to affect him today, both as an individual and as a physician. Image courtesy of Robert Ferry, Jr.